You may be wondering, “the network was down, why did I get an emergency alert?” On Tuesday morning last week, a networking issue prevented access to many core university services such as email and Trunk. Normally the University uses email to send notifications that are timely but don’t require an interruption of what you’re doing. Of course, when email is down we have to look to other methods to send the message. Our crisis communication protocols provide for the use of higher-tier communications modalities if the preferred channel is unavailable, e.g., when email and other core systems were down and we wanted to let you know. A message displayed on your computer screen is the newest and fastest alerting modality available at Tufts. Last week was also the first large-scale use of a new message delivery technology, desktop alerting. Nearly 400 computers received the alert and displayed the message shown at right. The median time to display the message was only 4 seconds, making it the fastest alerting modality in our communications arsenal. 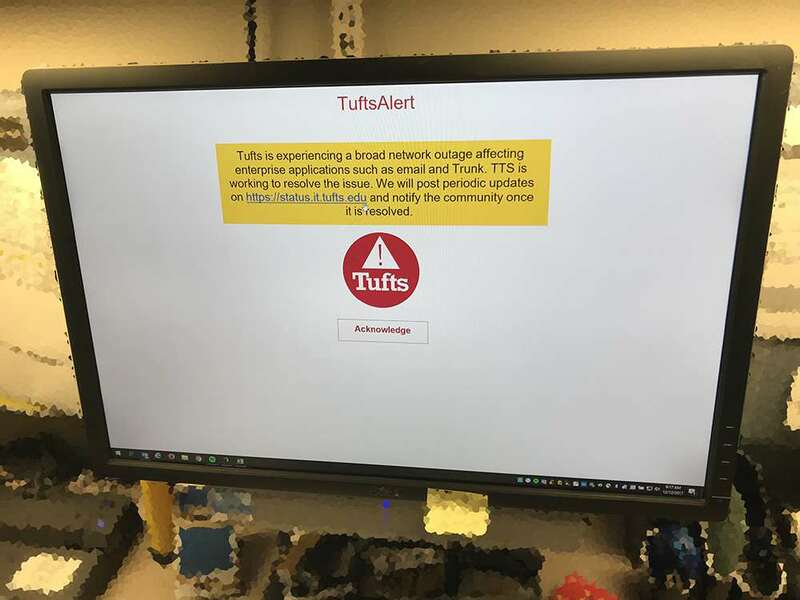 Tufts Technology Services (TTS) is rolling the service out to additional university computers over the next several weeks, and users of personally-owned computers can download the desktop alerting client online. TTS has a new service to help keep the Tufts community informed about IT system maintenance, outages, and other downtime – status.it.tufts.edu. The website provides real-time information on outages and expected resolution timeframes, including the initial announcement and updates from last week’s data center network outage. The page is hosted off-site to ensure it’s accessible even if Tufts IT services are interrupted. You can sign up for email and text alerts (and it’s a good idea to subscribe with a non-Tufts email or text if you want to make sure you get messages about Tufts email outages). At the risk of “over alerting,” we send important messages via multiple channels. We can’t always predict which methods will work or get to you fastest, and sending to text, email, voice, and desktop alerting helps us to make sure people receive the message by at least one of those methods. In the case of last week’s outage, it’s useful to note the value of having a non-Tufts email address in TuftsAlert. You can update your alerting contact information at emergency.tufts.edu/alertupdate.